New Delhi: Shivinder Singh, the younger of the two warring brothers whose business empire was once worth billions, requested a court on Thursday to withdraw a case he had filed against brother Malvinder after their mother and family elders brokered a truce between the siblings. In their request, Shivinder and his wife Aditi S. Singh also sought the liberty to approach the court again if mediation by family members failed. The case against Malvinder and business associate Sunil Godhwani was to come up for hearing at the New Delhi bench of the National Company Law Tribunal (NCLT) on Friday. 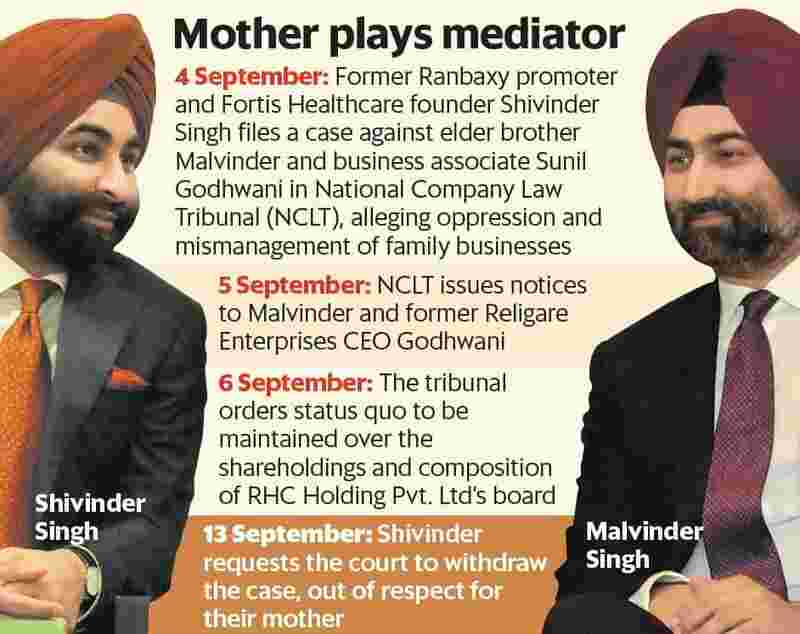 On 4 September, Shivinder had filed a case against his elder brother and Godhwani, a former chief executive of financial services company Religare Enterprises, blaming the two for oppression and mismanagement of family businesses. The two brothers have seen a dramatic fall in their fortunes in the past six months, with much of their public shareholdings seized by lenders. Irregularities at Fortis Healthcare Ltd, which was earlier controlled by them, are being probed by financial authorities, including the Serious Fraud Investigation Office. “The mother of petitioner No. 2 (Shivinder) and respondent No. 2 (Malvinder) has requested both her sons to engage in mediation led by family elders respected by both her sons with a view to them settling inter-se issues between them," said the petition filed before the NCLT. Mint has reviewed a copy of the petition. People close to the Singh family said elders in the family were trying to resolve the issues between the brothers concerning the management of RHC Holding Pvt. Ltd, a family holding company, and other liabilities including a $500 million arbitration award to Daiichi Sankyo over fraud allegations related to the 2008 sale of drug maker Ranbaxy Laboratories. “Out of respect for their mother, the parties have already started mediation and as per the request of mediators to constructively progress the mediation, the petitioners wish to withdraw the captioned petition, without prejudice to their rights and contentions," the petition said. In his Thursday petition, Shivinder has retained the option of reviving his complaint if the mediation fails, a person close to the family said, requesting anonymity. In his 4 September statement, Shivinder had accused Malvinder and Godhwani of the collapse of their businesses. “The collective, ongoing actions of Malvinder and Sunil Godhwani led to a systematic undermining of the interests of the companies and their shareholders... as also the committed and loyal employees of the group...," he had said. “I mutely watched the organisation I founded come to a point where it was publicly auctioned; where my family and myself have been stripped of our legacy, our finances and my personal credibility." On 2 July, Mint reported about serious differences emerging between the brothers, the two former promoters of Fortis Healthcare. Fortis Healthcare has said it will appoint an external agency to undertake scrutiny of its internal controls and compliances after an investigation found systemic lapses in funds allegedly taken out of it by erstwhile promoters Singh brothers. The role of the brothers is also being probed as part of the investigation. “Shivinder had built an asset which has been ruined. The mediators are looking at steps that can be taken to make things better for both," said another person. Shivinder in his earlier statement said he had retired and left for Radha Soami Satsang Beas, a spiritual organization, in December 2015, leaving Fortis in supreme financial health and hence he had no hand in any wrongdoing. He questioned decisions taken in Religare’s non-baking financial arm; the transaction and subsequent management of the sale of the group’s then flagship Ranbaxy to Daiichi. “All these only go to show that the malaise is systemic," he said, adding the damage caused was irreparable. “Despite my best efforts, on my return from Beas for the past many months to salvage the situation, the continued systemic missteps resulted in a quicksand, which now seems beyond resolution, if I continue to remain silent," he had said.